Sean Carroll is an artist, photographer, media producer, and dad, newly found in Pittsburgh after over a decade in New York City. He grew up in coastal Massachusetts, rides a bike year-round, and is a fan of the Boston Red Sox and the scenic route. For more info on his various photography and video projects, visit his websites: seancarrollphotographs.com and seancarrollevents.com. 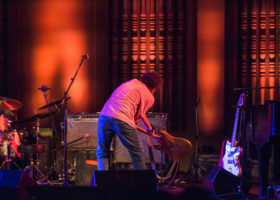 On Wednesday, September 14, The Warhol’s Sound Series presented Yo La Tengo and Lambchop at the Carnegie Museum of Art.